"This large home, which looks like something out of Architectural Digest, offers luxury accommodations in a beautiful setting. " The beautiful bed and breakfast is furnished in charming pastel Hawaiian decor. 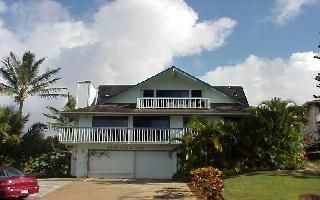 The guest living room, dining room and lanai lead to private decks and entrances for all guest rooms. The Royal Hawaiian Penthouse Suite is the entire top floor (1, 000 square feet); it has a dressing room, washer / dryer, whirlpool bath, panoramic golf course view, 360-degree vista of ocean and mountain, cathedral ceilings and private balcony for romantic sunsets. See papaya, pineapples, coconuts, and bananas growing on the property. Enjoy fruit smoothies and Kona coffee with your bountiful continental breakfast every morning. This wonderful sit-down meal is served in the dining room. The Bali Hai Mountain room has a queen size bed, tub/shower, TV, hidden refrigerator, and distant ocean view. The Golf Course room includes king size bed, tub/shower, TV, and refrigerator. The Honeymoon Suite features a golf course and ocean view, king size bed, dinette, sitting area, deck, and luxury whirlpool bath plus shower. 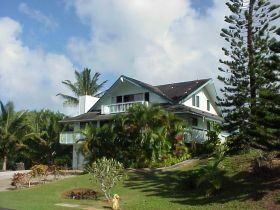 We are located in the Princeville Resort on the 6th green of the Makai golf course. Prisene som vises her er uten skatt. Skatt vil bli lagt til din endelige betaling. Et ekstra innskudd kan bli forespurt før ankomst. I så fall vil du bli kontaktet direkte etter at du har bekreftet bestillingen. Med mindre annet er angitt, kan bestillingsbetalinger ikke refunderes. # Cancellation Policy: 30 day notice. Take 56 North from Lihue... about a 45 minute ride. Go to the main Princeville Resort entrance with the guard house. Go to the third street on the right... Kamehameha Road.